The Bradford Sling® is designed to apply even pressure over the arm, this is achieved using adjustable hook and loop straps to get a secure fit. The sling can then be suspended using the multipurpose strap, or can be held against the patient's body. This makes the sling flexible for use in and out of clinical settings. Since the events of the Bradford City Stadium Fire, burns treatment has come on a long way. The Bradford Sling® was developed by Professor Sharpe at the Bradford Plastic Surgery and Burns Unit. Don't accept imitations, this is the original Bradford Sling®, manufactured on behalf of Bradford City Hospital. As such a proportion of all revenue is contributed to Bradford Hospital. Although developed originally for burns, The Bradford Sling® is used throughout all aspects of orthopaedic surgery. Any time that an arm must be comfortably immobilised or elevated, The Bradford Sling can be used. We see this in evidence around the world. The NHS has been buying this product since 1987 for all aspects of arm, hand and wrist surgery. 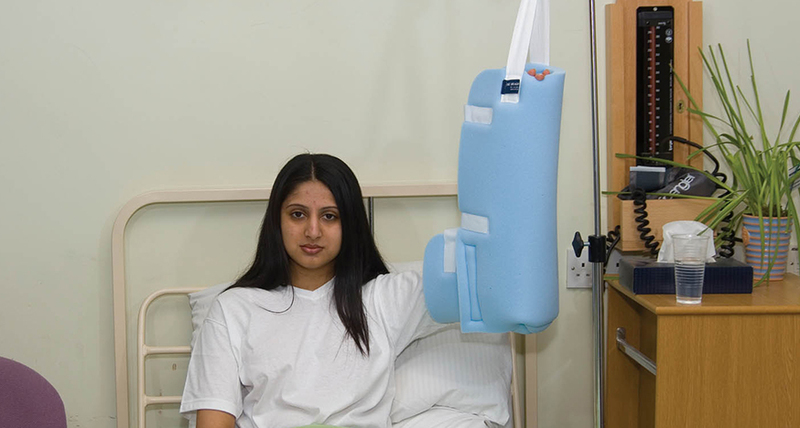 The Bradford Sling® is also used in hospitals around the world, and in the homes of patients post surgery. To learn more about the history of The Bradford Sling® please click here.